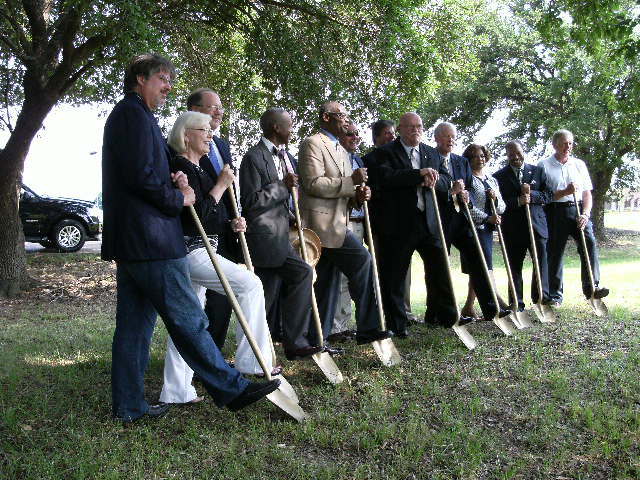 Today, on the campus of Saks, Inc., the Metrocenter Area Coalition along with the Hinds County Board of Supervisors hosted a groundbreaking ceremony for a $1.4 million landscaping project to be installed on Highway 80. This project is being funded by a grant in which Hinds County supplied $260,000 in matching funds and will feature the installation of flowers, trees, and shrubbery along U.S. Highway 80. Inmates from the Hinds County Sheriff’s Department will assist with the maintenance of the landscaping once it has been installed. Nina Holbrook, Executive Director of the Metrocenter Area Coalition served as Master of Ceremony during the event while dignitaries of the likes of Hinds County Supervisors Peggy Hobson-Calhoun and George Smith, and Hinds County Sheriff Malcolm McMillin offered words of praise for the beautification project. Nina Holbrook also gave major kudos to Al East, former owner of Highway 80 business East Ford, for his persistence in realizing this project. The landscape architectural firm for this project is Weatherford McDade of Jackson, Mississippi. Attendees at the event ranged from real estate developers to Jackson Chamber of Commerce Representatives to public officials. While commencement and completion dates were not announced during this ceremony, it is certain that this project will be a much needed enhancement towards the beautification of West Jackson.